Hey there, Vintage Purse People! I’m sorry I haven't posted for a while. You know how that goes. Life and such. I’ve been busily working at my day—and sometimes, night—job as a professional freelance writer, mostly writing articles and advertorials for a newspaper. I have great news to share. 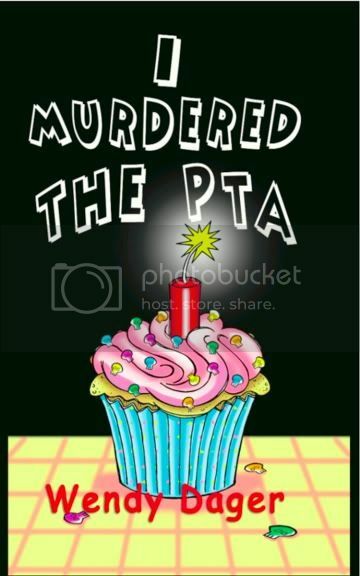 After an 11-year journey, my comic mystery novel I MURDERED THE PTA is now available from Zumaya Publications under its Enigma imprint. I MURDERED THE PTA was a TOP FIVE finalist in Court TV's 2006/2007 Search for the Next Great Crime Writer. 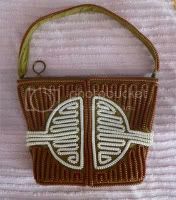 “Telephone” Cord Purses. 1940s. Maker: Unknown, but possibly Plasticoil. One very large clutch style cord bag in primary colors and another in brown and white on greenish-brown fabric backing with an Asian-style motif. I’ve mentioned this before as I have several of these wonderful bags in my collection, but these are NOT telephone cords. A story that was told to me—and I can’t validate it—was that, after World War II, plastics companies were looking for something else to create after contributing necessary items to the war effort—which was then over. So, someone decided to make these cool purses. Again, I don’t know if this information is correct. What I love about these is that the clutch is an unusually large size, so I can actually carry ALL of my stuff in it. The other has that fabulous design. I’ve seen it before, but not in brown and white. As for pricing—these two ran the extremes. I paid way too much for the clutch—but I wanted it SO BAD. The other was very inexpensive. I’m not tellin’, but let’s just say my mojo was working for me that day.